Lucknow, April 17 (IANS) Union Minister Mukhtar Abbas Naqvi has been booked for calling Samajwadi Party leader Azam Khan â€˜Mogambo, a popular villain character from Bollywood. The Union Minister of Minority Affairs referred to Azam Khan as Mogambo during a rally in Rampur on Monday, after Khan in a Sunday event made slanderous remarks against BJP candidate Jaya Prada. Rampur Additional Superintendent of Police, Arun Kumar Singh told the medai that the Magistrate who was monitoring the rally has given a complaint and on that basis a case has been registered against the Minister for violation of the model code of conduct. Magistrate M.K. 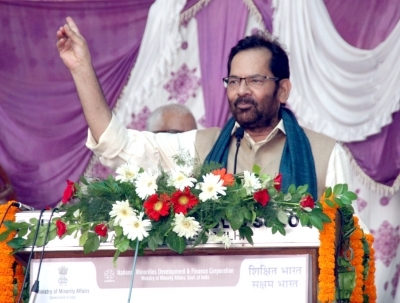 Gupta said in his complaint that Naqvi's statement could cause animosity and was a violation of the poll code.